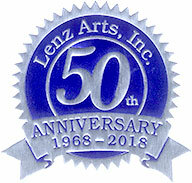 Serving you for over 50 years, Lenz Arts offers the largest selection of fine art supplies and the oldest custom frame shop on the Central Coast. Described as "one of the last real art stores on the West Coast," people drive for hours to take advantage of our comprehensive stock and knowledge. From the finger-painting toddler to the professional gallery artist, we've got you covered! 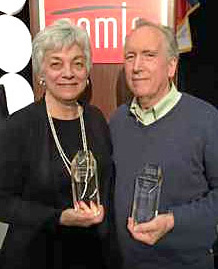 Andy & Cynthia Lenz, founders of Lenz Arts, were presented with the International Art Materials Association's 2016 Lifetime Achievement Award to honor their significant impact on the fine art materials industry. 22x30 white, 250 grams, acid-free. 100% cotton, 100 Pack. In-Store DEMO LECTURE - Free-ish*! Saturday, April 27, 11 a.m. - 12:30 p.m.
Saturday, April 27, 2:30 - 4 p.m.
*$15 (Later Credited) Registration Required! We are honored and thrilled to have the one, the only, Scott Gellatly of Gamblin Artists Products here at Lenz Arts! Scott is Robert Gamblin's right-hand man. Aside from an astounding amount of oil painting product knowledge floating around in his head, Scott is an amazing landscape painter in his own right. As artists, we are always working within the confines of our materials. For 600 years, oil colors have been the preeminent medium of visual expression. And within this time, the world has become increasingly more colorful. We see this, not only in painting, but in the cars we drive and the clothes we wear. As painters living and working today, we have more color choices to us now compared to painters who came before us – a fact that is equally intimidating as it is inspiring. How can we express a unique color voice to make color our own? This lecture demonstration explores the evolution of painters’ most important tool: COLOR. What aspects of colors do painters consider when selecting a palette to express their artistic vision? 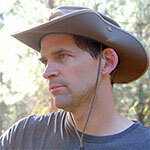 Scott Gellatly is a working artist and Product Manager for Gamblin Artists Colors in Oregon. He consults with oil painters worldwide on technical issues and is involved in developing and testing all of Gamblin oil colors and mediums. Scott has given presentations on oil painting materials throughout the U.S., Canada and Australia. 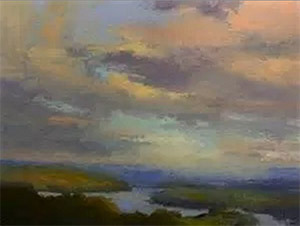 He holds a Bachelor of Fine Arts from the University of Oregon and has exhibited his paintings throughout the United States. His work can be seen at scottgellatly.com. PARKING Car parking will not be available in the Lenz Arts parking lot. Free parking can be found either behind the lawyer's office across the street or on the streets around Holy Cross Church. There are metered spaces nearby as well. Important! You must register to guarantee yourself a seat! • When you attend the presentation, your full $15.00 registration fee will be refunded to you in the form of a credit valid on that day for any Gamblin products. • There will be assigned seating. • If you register but learn you cannot attend, refunds will only be provided for cancellations 48 hours in advance of the presentation—we need time to fill your vacated seat from the waiting list. If yours is canceled, can you attend the other session? Yes, let me know, I'll attend the other session No, refund my payment. If you are having problems getting registered, call us at (831) 423-1935 and we can help you reserve your seat. Saturday, May 11, 2:30 p.m. - 4:30 p.m.
*$10 (Later Credited) Registration Required! Getting a painting off to a strong start can make all the difference. Terri Ford's Deeper, Darker, Richer technique does just that, both in the studio and plein air. It is highly versatile and can easily enhance your own painting style. Terri will demonstrate how the base it creates can be lightened and or brightened as much as you wish. Terri will also talk about color temperature and the importance and power of "mark making". Terri will be using the deepest, darkest and richest of Sennelier Extra Soft Pastels. Working with Degas, at the turn of the 20th century, the Sennelier family developed some of the most beautiful pastels. See for yourself why they are the best for your work. 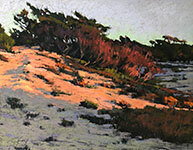 Terri Ford has worked in pastels since 1987 and won a plethora of awards in numerous exhibits as well as recognition in worldwide publications. 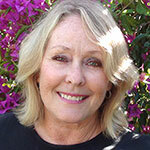 Her mantra "Deeper, Darker, Richer" has helped her create vibrant, luminous works in a relaxed, impressionistic style. She prefers the landscape both studio and plein air and is often seduced by interesting, old, historic architecture like backroad barns or an arched bridge in Paris. Terri's painting "Eiffel Tower Winter" is featured on the front of Sennelier's most popular set, The Paris Collection (containing the entire 120 colors of half stick pastels). Last summer Terri was the Invitee de Honneur of the Art du Pastel en France. Her designations include: IAPS Eminent Pastelist, PSA Master Pastelist, PSWC & PSNM Distinguished Pastelist, CAC Artist Member. She is a popular, enthusiastic, and effective workshop instructor. • When you attend the presentation, your full $10.00 registration fee will be refunded to you in the form of a credit valid on that day for any Sennelier products. And more demos coming. . . check back for more information! Want notices of our free demonstrations? Sign up for our demo email list! 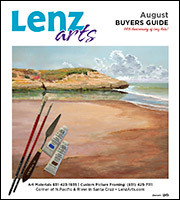 You'll hear about our demos and we'll include news, art information, specials, some humor and otherwise keep you in touch with happenings at Lenz Arts, the art mecca of Santa Cruz! Lenz Arts is imports Silk Cut Lino, the pinacle of printing linoleums! Our 10,000 square foot locationwall to wall supplies for you! Hours, directions, and full contact information. Do you have a class list? Join us for notices of our free art demonstrations!